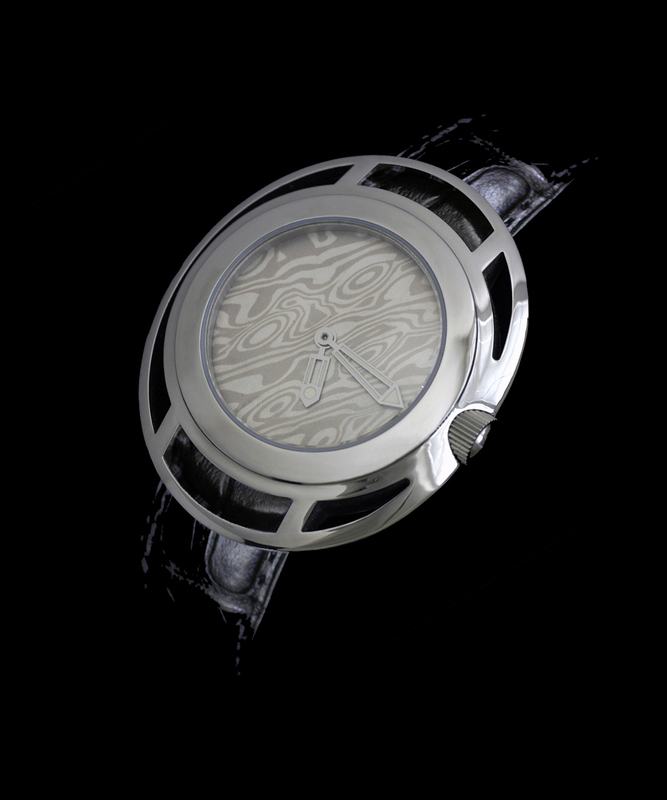 Dial: Handmade white gold palladium and silver Mokume dial crafted by James Binnion. The intricate wood grain pattern is achieved through hand carving, forging and repeatedly rolling the metal. Case: Rubin Douglas watch cases are made in the local northeastern United States from stainless steel 316ls. Each case is hand-machined using a combination of lathes, milling equipment and custom-designed tools to create the intricate curvatures of each Rubin Douglas timepiece. Cases can be purchased with either a hand polish or a custom matte finish. Dial: Rubin Douglas dials are designed and crafted in the United States by local artists and designers. 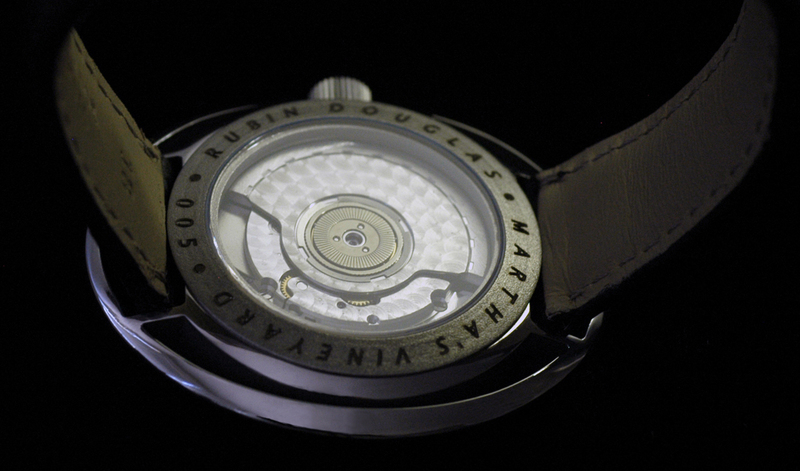 Each dial is made by hand exclusively for Rubin Douglas. Movement: True to the Swiss tradition of watchmaking, Rubin Douglas employs Swiss-crafted movements. All Rubin Douglas timepieces are powered by Automatic movements. Each movement features 21 ruby jewels and is decorated with engine turning on the bridges and the rotor. Assembly: Rubin Douglas timepieces are assembled and tested by master watchmakers trained in the finest Swiss watchmaking schools under the tutelage of world renowned watchmakers. Our watchmakers meticulously inspect and build Rubin Douglas timepieces from the finest components to the strictest Swiss watchmaking standards and practices. Crystal: Domed sapphire crystal and sapphire crystal exhibition back. Strap: Rubin Douglas timepieces feature alligator straps hand-crafted in the United States. Packaging: Rubin Douglas timepieces are presented in Orbita watch winders. To Purchase a Rubin Douglas Timepiece please visit our retailers section, or to order directly from Rubin Douglas Contact US. Copyright. All rights reserved. Rubin Douglas. 2004-2010.